According to the latest USDA cost of production estimates, U.S. farmers will find the 2017 cost of producing corn, soybeans, and wheat basically unchanged from 2016. Combined with the outlook for flat to slightly better commodity prices, the cost of production estimates portray yet another year of challenging economic conditions throughout corn, soybean, and wheat country. The USDA estimates the cost of production for several agricultural commodities each year. We will focus on the estimates for corn, soybeans, and wheat. The estimates are of the “average” cost of production throughout the U.S. As a result, caution is urged when comparing these costs to costs in a specific region, as yields, production practices, and other conditions can vary greatly throughout the U.S. Still, the cost estimates provide some useful information regarding the economic environment facing U.S. producers. The average cost per acre of producing each crop is shown in Figure 1. For each commodity, the total cost is broken into its various components. The components are organized with the variable costs of production at the bottom of the bar. These include seed, fertilizer, chemicals, fuel, repairs, and other variable costs. The next cost categories are those typically thought of as fixed expenses and include capital recovery on machinery, land, labor, and other fixed expenses (such as interest expenses). Figure 1. 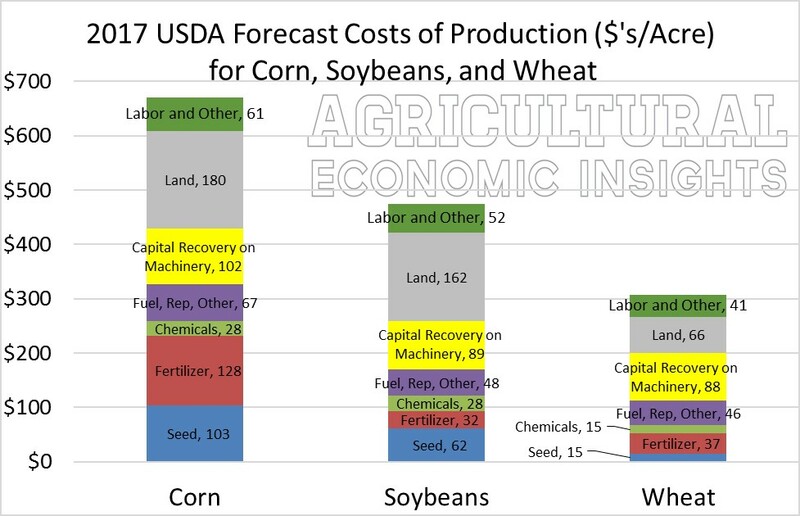 2017 USDA Cost of Production Forecasts for Corn, Soybeans, and Wheat. As we pointed out last year, the cost structure or split between fixed and variable costs, differs from crop to crop. For instance, variable costs account for just under 50% of the costs of growing corn, and about 35% of the costs of growing soybeans and wheat. This is driven in large part by the differences in fertilizer and seed expenses. For instance, fertilizer costs for corn are just short of $100 per acre greater for corn than soybeans and wheat. In the case of corn, both seed and fertilizer costs individually exceed the cost of capital recovery on machinery. This is different than the case of soybeans and wheat. Here, a much smaller proportion of the costs of producing the commodity are accounted for by seed and fertilizer. For producers with serious capital constraints, this likely has some impact on how they would think about the attractiveness of the various crops. A farmer tight on cash that owns equipment will likely find producing soybeans relatively attractive to corn at current prices. Given the higher fertility and seed costs, the overall cost of producing corn is much higher than other commodities. Considering only the variable costs of production, planting an acre of corn instead of soybeans requires an additional $157 of variable costs per acre. Such considerations can be quite important in today’s tight economic environment and is likely part of the reason that soybeans plantings are set to gain significant acres on corn. In other words, changes in crop mix can have a large impact on the cash required to operate a farm. While corn has always required a larger investment in inputs, its potential return has often justified the investment. To look at the impact of yields and commodity prices we used USDA’s estimate of the cost of production, trend yield estimates, market year average prices to calculate the expected contribution margins and profit for corn, soybeans, and wheat. The trend yields and estimated market year average prices were taken from the estimates given at USDA’s February Agricultural Outlook Forum. The profit and loss associated with each crop is shown in the bottom two rows of the table. None of the crops show a budgeted profit at these cost, price, and yield combinations. The results could be best described as ranging from terrible (wheat) to getting close to economic break-even (soybeans). Wheat producers are expected to lose $2.23 per bushel. To put how bad the situation in wheat is in perspective, wheat prices would have to increase by 51% just to reach economic break-even levels! The situation in soybeans is much better, where only slight price increases would result in economic profitability. It’s no wonder that the nation’s largest wheat producer, Kansas, is expected to decrease wheat plantings by 1 million acres and increase soybean plantings by roughly the same amount it 2017. With respect to corn production, the total cost of producing corn is now $3.92 per bushel. Just a couple of years ago, the cost of production estimate at trend yields was $4.11, so forecast costs have come down $0.19 per bushel since 2015. This is a rather substantial amount. At the 2017 trend yield this amounts to $32 per acre. The economic picture in agriculture continues to be rather unappealing. At the USDA’s estimates of costs, yields, and prices corn, soybeans, and wheat all show negative economic returns. The good news is that production costs have fallen so that a modest price recovery for soybeans or corn would restore profitability. In the case of wheat prices would require a much larger rebound to restore profitability. In the last few years many producers have likely experienced lower costs per bushel than those shown in Table 1 because they have achieved higher yields. This has helped for those that had exceptional yields, but has also placed continued pressure on crop prices. For producers in areas that did not achieve exceptional yields times are likely quite difficult. It is likely that these regional stresses will soon start to show. For now, the continued mantra in the ag sector will likely be cost control. However, it is important to keep in mind that modest price improvement could open the door for an opportunity at profits, something that would be very welcome in the ag sector.